Pushpa Guest House kohteessa Pokhara, Nepal: Varaa nyt! 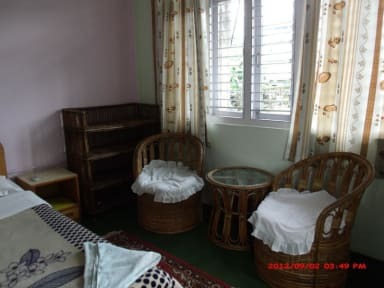 The Pushpa Guesthouse is a family owned and operated guesthouse in the lakeside area of Pokhara, Nepal. 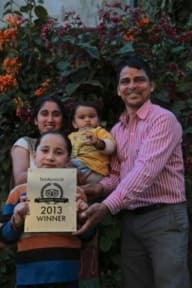 Our guesthouse is operated by a manager, Raj Ojha, with over twenty years of experience in treking as well as the tourism industry.now raj has trekking company as well.his trekking company name is 'Himalayan Dreamland Trekking'pvt.ltd.you can book your trekking with him.you can check www.himalayandreamland.com. We have 12 well furnished & carpeted rooms with attached bath room / toilet. There is hot & cold water running 24hrs. a day to make your experience more pleasant. From some of our selected rooms you can see the mountain Machapuchare and the World Peace Pagoda from it's terrace on the adjacent mountaintop. For the pleasure of our guests the 1st floor has a balcony furnished with armchairs and tables for your comfort. In the garden you can have a morning coffee/tea or breakfast and have a good start to a great day. Our Family is very friendly and helpful with any requests and we will give you all support requiring access and information concerning our local attractions. For our guests we have available free access to the internet which situated in our reception area and free access to Wi-Fi throughout the building.